Don’t wash your treatment down the drain! Use this specially formulated sulfate-free cleansing system to effectively remove impurities, not your treatment. An exclusive, sulfate-free cleansing system that extends the life of Brazilian Blowout treatments leaving hair with incredible body and movement. • Maintains vital moisture and protein balance. • Adds softness and radiant shine. Açai Deep Conditioning Masque is a creamy rich, intense conditioning formula that resconstructs, strengthens and smooths the hair by coating each strand with an exclusive Brazilian Super-Nutrient Complex. This complex repairs and fortifies the hair while eliminating frizz, promoting shine and guaranteeing the longest lasting smoothing result. 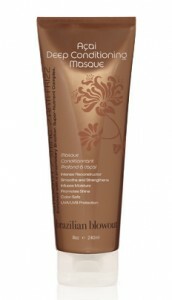 We call it a “mini Brazilian Blowout in a tube.” You’ll call it a miracle worker! 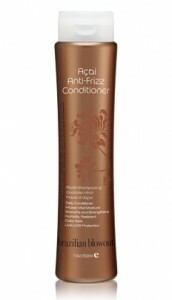 • Heat-activated formulation straightens waves & curls. • Protects hair from heat styling and environmental stresses.